Both former President George W. Bush and President Obama have endorsed the goal of having electronic health records in wide-spread use by 2014, just five years from now. But previous efforts to introduce electronic patient records into the health care system have not gone far. 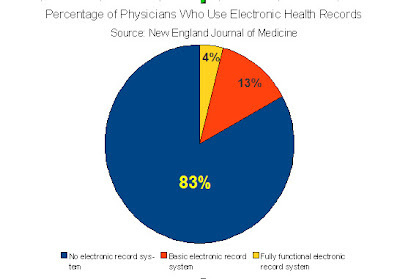 According to a report released by the New England Journal of Medicine in 2008, 83% of physicians polled had no electronic patient records whatsoever and 13% had a very basic system. Only 4% had fully functional systems. In addition to the problem of providing physicians with point of care terminals and devices that can be used to enter patient data and information, there is the further problem of inter-connecting multiple electronic patient records from different health care centers as well as physician offices. Recent health care privacy legilation in the form of HIPAA privacy requirements also complicate the intoduction of electronic patient records. I remember sponsoring research into this area while at Digital Equipment Corp. in the early '90s. There was alot of enthusiasm for this in many quarters then, but not much progress has been made in the the 18 years since. Two weeks ago House Democrats introduced a fiscal-stimulus bill that includes $20 billion for health-care information technology. While a good start, given the long time that electronic health care records have taken to make this minor a penetration into the market, and given the ultimate cost of having full-fledged, inter-connected electronic patient records, it seems that greater sums and a longer time frame than 5 years will be required to generate the desired results. Update (2/25/09): Although little formal research has been done into the effects of medical information technology on patient outcomes, a study just published in the "Archives of Internal Medecine" points to improved outcomes for patients where medical decision support systems are used. The study, led by Dr. Ruben Amarasingham, found that "hospitals with automated notes and records, order entry, and clinical decision support had fewer complications, lower mortality rates, and lower costs." "For all medical conditions studied, a 10-point increase in the automation of notes and records was associated with a 15% decrease in the adjusted odds of fatal hospitalizations (0.85; 95% confidence interval, 0.74-0.97). Higher scores in order entry were associated with 9% and 55% decreases in the adjusted odds of death for myocardial infarction and coronary artery bypass graft procedures, respectively. For all causes of hospitalization, higher scores in decision support were associated with a 16% decrease in the adjusted odds of complications (0.84; 95% confidence interval, 0.79-0.90). Higher scores on test results, order entry, and decision support were associated with lower costs for all hospital admissions (–$110, –$132, and –$538, respectively; P < .05)." In an editorial in this same issue of Archives of Internal Medicine, Dr. David Bates cites studies which show a potential $88 billion in savings over ten years were health information technology (HIT) to be adopted broadly.